Everyone loves Google Voice, but what’s better than using it from your computer? Using it on your phone of course! iPhone users are still stuck using the HTML5 browser version, but on Android you can download the full app that works as a virtual phone on your phone! Ring multiple phones from one number, including your Gmail. Call scheduling, after 10pm all of my calls go straight to voicemail! Voicemail transcription and playback & txt’s you a summary. I personally hate dialing in to check my voicemail and this gets rid of that! 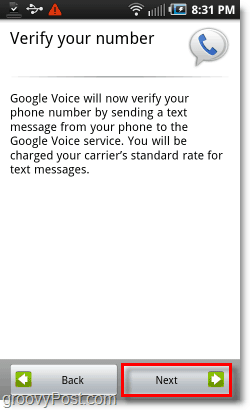 No more invite nonsense to get a Google Voice #. ANYONE can get an account now. Good enough to try it out on your Android? Lets set it up then on our Android! 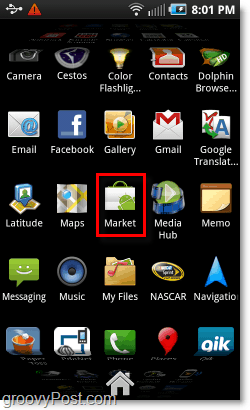 On your Android phone the Market app will be located in the App Drawer, or on your home screen as a shortcut. Tap Market to open it. In the Android market, Tap the Search icon. In the search box that appears, Type in Google Voice. 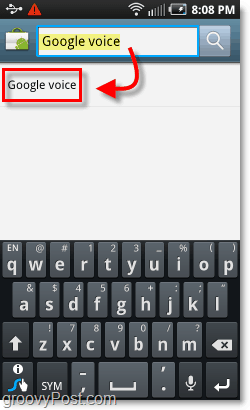 Tap the Google Voice option that appears below the search box to initiate the serach. Step 4 – Be sure to install the right one! 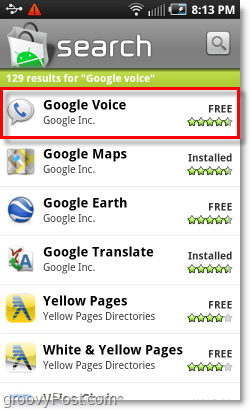 Now the results should display quite a few Google apps, but the one on top should be Google Voice by Google Inc. Tap the Google Voice result. The Google Voice app will display some brief information on it’s page, but at the bottom is what we are looking for. Tap Install. 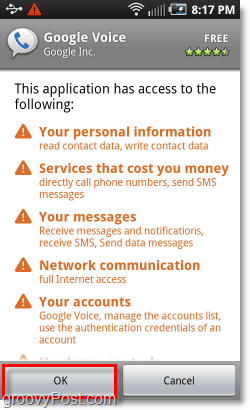 As with all applications, Android will warn you that Google Voice will have access to different parts of your phone. Google Voice certainly does access A LOT of your phone, but then again it needs to in order to function properly. Tap OK to confirm. 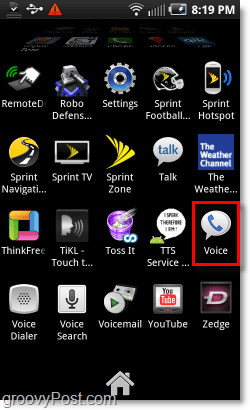 Once the installation finishes, your Google Voice app should show up in your App Drawer. Be sure to look for the Google Voice icon! Tap Voice to open it. The first thing you see when the app runs is the welcome screen. Google will just tell you what it is, and what it does. To continue, Tap Next. You’ll need a Google account at this point, and hopefully one that you’ve already set up Google Voice on. If you haven’t, head on over in your browser and set your Google account up to use Google Voice, anyone can do it now that it has gone public! 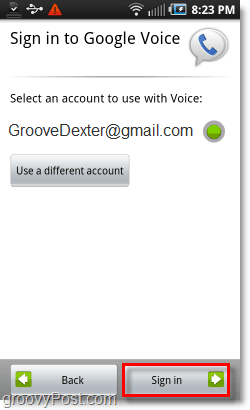 If your Google Account is already set up with Voice, enter your account info and Tap Sign in. 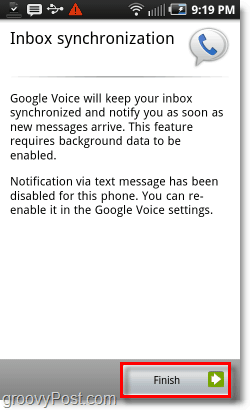 After sign-in is complete you’ll be notified you have access to Google Voice from this phone. Tap Next. 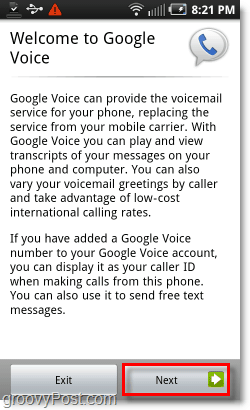 If you haven’t already added your cell phone number to Google Voice here is where to do it. Tap Add this phone. 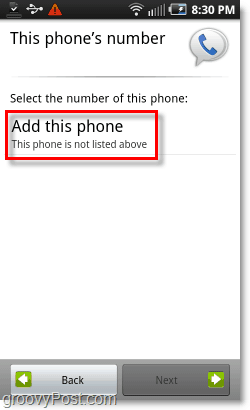 If your cell phone is already on this Google Voice account, Tap your number from the list. 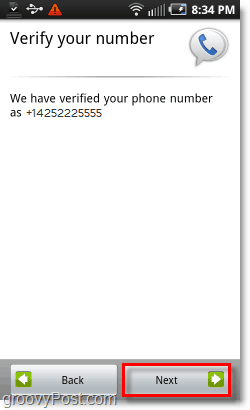 Unlike the web-based Google Voice, the app will automatically verify your phone number by sending a text message. This is just a standard text message that will count as 1 outgoing text according to your providers texting plan. Tap Next. After verification is complete, Tap Next again. 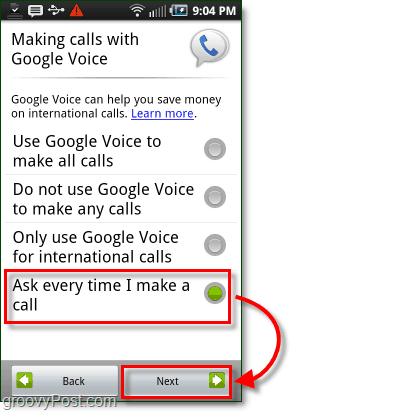 *With this setting you can still make calls using Google Voice, but that must be done from within the Google Voice app. *A dialog will appear every time you send a call or text asking if you would like to use your Google Voice number to send it. 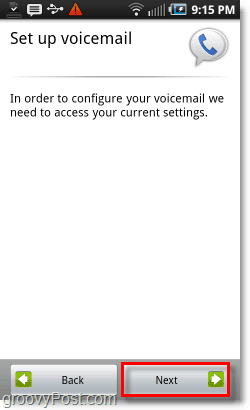 From what I can tell, automatic voicemail setup is rather buggy. Sometimes it works, sometimes it doesn’t. Tap Next to give it a shot. There is a manual way to configure it, but it can get really really confusing. 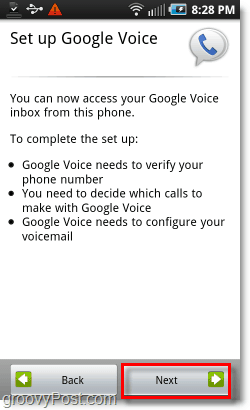 A MUCH easier way to configure your Google Voicemail is to just go to http://www.google.com/voice, sign-in, and set it up. Stay tuned over the next couple days as I’ll be posting a few more Screenshot tours of Google Voice in action on the Android as well as a few tips N’ tricks! Aye…. Google Voice is only good in the US and Canada… Sorry bro! Ja we vallen buiten de boot helaas. @shocker – I thought you can call Canada but google voice I think is us only. ? You can call to Canada no problem for free. I’ve heard some people saying that you couldn’t get the Google vice to work in Canada. I’m not sure if it doesn’t work with the phones/carriers in Canada. I just had a layover several days ago in Vancouver BC so I switched my phone to use Google voice only and was able to make and receive calls with zero problems. It was really awesome! I can only use it from within my Gmail Account, I can not make it work yet in Colombia. :( anyway I am happy being able to call for free to the US form here! Good info to know Jose. Keep us updated if you can get it rollin…. have you tried the browser version from the phone? 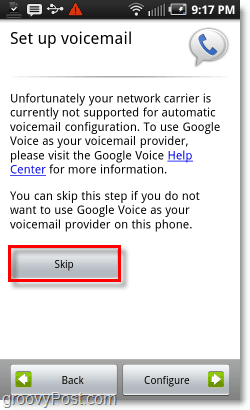 I have Google voice on my Gmail, I want to use it from my android phone, I tried the instructions you provided but I could not find (in Play Store) the Google Voice you referred to in step 4; can you please advice what to do in order to use my Google Voice account from my android phone?